Worried your sore throat may be strep throat? Strep throat is a common type of sore throat in children, but it’s not very common in adults. Doctors can do a quick test to see if a sore throat is strep throat. If so, antibiotics can help you feel better faster and prevent spreading it to others. Viruses are the most common cause of a sore throat. However, strep throat is an infection in the throat and tonsils caused by bacteria called group A Streptococcus (group A strep). Group A strep live in the nose and throat and can easily spread to other people. It is important to know that all infected people do not have symptoms or seem sick. People who are infected spread the bacteria by coughing or sneezing, which creates small respiratory droplets that contain the bacteria. Rarely, people can spread group A strep through food that is not handled properly (visit CDC’s food safety page). Experts do not believe pets or household items, like toys, spread these bacteria. Other symptoms may include a headache, stomach pain, nausea, or vomiting — especially in children. Someone with strep throat may also have a rash known as scarlet fever (also called scarlatina). 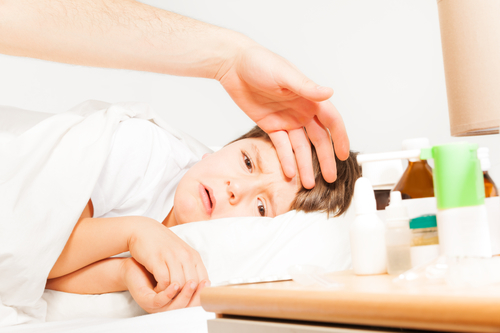 It usually takes two to five days for someone exposed to group A strep to become ill. Anyone can get strep throat, but there are some factors that can increase the risk of getting this common infection. Close contact with another person with strep throat is the most common risk factor for illness. For example, if someone has strep throat, it often spreads to other people in their household. Only a rapid strep test or throat culture can determine if group A strep is the cause. A doctor cannot tell if someone has strep throat just by looking at his or her throat. A rapid strep test involves swabbing the throat and running a test on the swab. The test quickly shows if group A strep is causing the illness. If the test is positive, doctors can prescribe antibiotics. If the test is negative, but a doctor still suspects strep throat, then the doctor can take a throat culture swab. A throat culture takes time to see if group A strep bacteria grow from the swab. While it takes more time, a throat culture sometimes finds infections that the rapid strep test misses. Culture is important to use in children and teens since they can get rheumatic fever from an untreated strep throat infection. For adults, it is usually not necessary to do a throat culture following a negative rapid strep test. Adults are generally not at risk of getting rheumatic fever following a strep throat infection. Doctors treat strep throat with antibiotics. Either penicillin or amoxicillin are recommended as a first choice for people who are not allergic to penicillin. Doctors can use other antibiotics to treat strep throat in people who are allergic to penicillin. Someone who tests positive for strep throat but has no symptoms (called a “carrier”) usually does not need antibiotics. They are less likely to spread the bacteria to others and very unlikely to get complications. If a carrier gets a sore throat illness caused by a virus, the rapid strep test can be positive. In these cases it can be hard to know what is causing the sore throat. If someone keeps getting a sore throat after taking the right antibiotics, they may be a strep carrier and have a viral throat infection. Talk to a doctor if you think you or your child may be a strep carrier. People can get strep throat more than once. Having strep throat does not protect someone from getting it again in the future. While there is no vaccine to prevent strep throat, there are things people can do to protect themselves and others. You should also wash glasses, utensils, and plates after someone who is sick uses them. These items are safe for others to use once washed. Take the prescription exactly as the doctor says to. Don’t stop taking the medicine, even if you or your child feel better, unless the doctor says to stop. Wash your hands often to help prevent germs from spreading.